« How can I find a two bedroom condo in Hawaii? There are many wonderful destinations throughout the world but if an adult only all-inclusive vacation is on your honeymoon list, your best choice may be a Sandals Resort. No kids are allowed at Sandals, everything is included from meals to drinks to scuba diving and golf, and romance abounds with beachfront locations, king beds in every room, gourmet dining, private pools, butler service and luxurious spas. So how do you choose the best Sandals Resort for you? Let’s start with location – Sandals has 14 all-inclusive resorts on 7 sun drenched Caribbean islands including St Lucia, Jamaica, Grenada, Barbados, Antigua, Exuma and the Bahamas. So your choice of destination should consider travel time, airfare, weather and what you’d like to see and do while on your romantic adult only vacation. The shortest flights and lowest fares are usually to Jamaica or Nassau, but St Lucia also has excellent air service from many U.S. cities and if travel time isn’t a major concern, a relatively undiscovered island like Grenada is an exotic destination that should be at the top of most honeymoon wish lists. Weather is a very important consideration and while all Caribbean islands enjoy sunshine and warm temperatures year round the Bahamas can be too cool for a bathing suit in December and more vulnerable to hurricanes in the fall. Jamaica is in the 80’s and 90’s year round as are the islands of St Lucia, Grenada, Antigua and Barbados and the southern Caribbean islands are also less affected by tropical storms and hurricanes. The beach is #1 for a lot of couples all inclusive vacations and details matter! Every Sandals Resort is beachfront but if you want to swim in the ocean a calm, shallow entry may be desirable unless of course you wish to body surf and waves are what you’re after! If you’d like to walk or jog on the beach size matters and and if you are worried about too much sun the availability of shade is important. 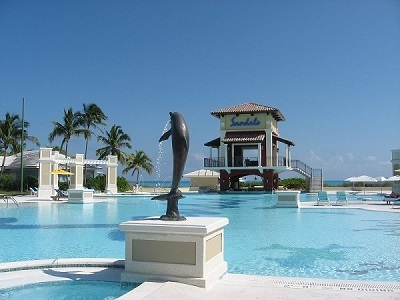 Which Sandals Resort has the best beach will depend on you but two of my favorites would be Emerald Bay and Whitehouse. Pools are important too and some resorts have much larger and more glamorous settings with fountains, huge swim up pool bars, jacuzzis, even fire pits designed into the pool area. Sandals Grande Antigua, Grande St Lucian and Grenada are a few with stunning pool areas. Activities will be a deciding factor for many couples choosing an adult only all inclusive vacation and Sandals includes more water and land sports than other resorts like Secrets, Excellence and Couples Resorts. But even within the Sandals group there are important differences so it’s time to be specific. Snorkeling, daily snorkel trips and scuba diving is included at every Sandals Resort but the colors are simply more vibrant in the turquoise Bahamian waters and healthy reefs off St Lucia and Grenada.You can climb a waterfall, swim with dolphins or go ziplining in Jamaica. Casinos and big name entertainers are in Nassau and golf is free in Exuma, St Lucia and Jamaica. Hiking is best on St Lucia and Grenada and Antigua offers the opportunity to swim with the rays or party with locals while watching the sunset at Shirley Heights. Waterskiing and tubing is offered at Sandals Negril, Sandals Whitehouse, Sandals Montego Bay and Sandals Grande St Lucian. Every Sandals Resort includes complimentary watersports such as sailing, kayaking, standup paddleboards, snorkeling and scuba but conditions vary so ask a Sandals Specialist for more detail. Fitness centers and land sports like tennis and volleyball are also included at every resort but in Jamaica you’ll find Sandals’ only rock climbing wall and squash courts. Once you’ve chosen a destination it’s time to think about which Sandals Resort is best for you. Are you looking for a casual beach atmosphere with open air dining or a more formal setting under crystal chandeliers? Are you a pool person, beach person or want a bit of both? Do you prefer small intimate resorts or would you enjoy resort hopping with dining, drinking and playing privileges at several locations? Last but not least, every Sandals Resort has about a million (slight exaggeration) room categories with prices starting under $2.5K for a one week all inclusive vacation for two to more than $10K for a once in a lifetime honeymoon in a fabulous suite with private pool and butler. But whether you choose a garden view room or beachfront villa, every Sandals guest will enjoy a couples only getaway with king beds, fine dining, name brand liquors, activities, entertainment and tips included. For more help choosing the best Sandals Resort you can email linda@totemtravel.com or call Linda, Sandi or Patty at (800) 321-7907. We’ve been to all of the resorts and whether you work with a Sandals Specialist or book online you’ll pay exactly the same price and the lowest is always guaranteed! P.S. Look for more on Sandals newest resort, Sandals Barbados.